Bramble Corner in Forest Row, Sussex. Click on picture to visit the website. A solid wooden fort and knights and princesses. Realistic looking farm animals and farm workers. What child would not love a go-cart like this one? Love this pink ride in car and the pretty dolls house behind it. I read about this traditional toy shop in a magazine years ago and have always wanted to visit it. Well yesterday we pulled in nearby and it did not disappoint me. Some of the toys reminded me of things I used to play with ... remember 'jacks' anyone? Those little metal stars you picked up while bouncing a little rubber ball. I also bought a Fortune telling fish. Can you remember those red plastic film fish you put in the palm of your hand to see if it rolls up (passionate!) or just moves its head (jealous!) etc. I love the wood fort. Do grandpas still spend hours in the shed making toys for small children? What a very special Christmas present a fort or a dolls house would be. I wonder if there are any woodworkers near Handmade Happiness who would be interested in making wooden toys for sale? I collect fabric, good cotton fabric or linen or velvet. If I see a nice piece of fabric in a charity shop for two or three pounds I buy it thinking I'll use it later. But recently the price of shirts, skirts, dresses etc in charity shops has gone up and I am never tempted. Also I have come to the realisation that I am never going to use most of these lovely fabrics I have collected so I may as well pass them on to someone like Pam who makes good use of any fabric she has whether it's in cushions or pictures or patchwork quilts. That is why I have a big bag of fabrics waiting to be given to Pam. I have kept back the calico and bits of Liberty I use for dolls but apart from dolls and the occasional Christmas decoration I don't need fabrics. Talking of fabrics I am looking forward to the Knitting and Stitching Show at Alexandra Palace in London from October 10th to 13th. There is always so much excellent work from art and fashion students to see plus hundreds of stalls selling craft materials. It's usually crowded but a feast for the eyes. I'll take some photos to share with you. Part of the new window display: Bear by Lindsey Agostinelli; beautiful wood cut cards by Rosamund Fowler; wren by Michelle Green; both jugs by Ali Cooper; baby hat and gloves by June Knight; bowl by Samantha Robertson; cup cake and cupcake card by Sue Inglis; toast rack by Kate Hackett and embroidered picture by Sheila Barrow. Silver rings by Kirstie Turner on a slate cake stand by Eve Deary. Cute key rings by Sue Inglis £6-50 each. These pictures are for my American readers. Local people can visit the shop and see all these lovely handmade gifts in the flesh! The reason I say this is because (a) it's been a quiet week in the shop and (b) at 7pm exactly last night 72 Americans were reading this blog simultaneously. That's the wonder of blogger, you can see who's reading it and when! The technology is still beyond my understanding. Part of the Christmas inspiration noticeboard showing a Natasha Rothschild reindeer, a Sandra Izard gift bag and an Eileen Brown red ceramic heart. The angel card is by Belinda Downes. I love its complexity. In a shop corner are sheep and cards by Sue Inglis, buttons by me, artist cards by Sandra Izard and sheep cushion (one of a pair) by Pam Dew. Part of the shop window showing Roly Phillips' vessels, Pam Dew's sheep cushion, a Frank Higgins kaleidoscope, velvet bag by Sheila Barrow and sheep by Sue Inglis. Talking to an artist about selling work online it seems the all important factor is the number of 'hits' your online shop gets. If no-one sees your website it's like selling at a craft fair when no-one is walking through the door. You've got to have 'footfall' to sell. The solution seems to be advertising. If people see your work in a magazine or colour supplement and like it they'll look at your website. And advertising doesn't need to cost anything. You can send a press release showing a photo of your work for the cost of a stamp. What do you think? Apparently Petersfield is in a dip so we tend to get mist or fog. Sorry I am late blogging this morning. Too much I want to do, too little I succeed in doing! Do you know that feeling? I enjoyed starting a Christmas making mood board yesterday in the shop which will inspire me and hopefully a few others to get started on making lovely things for Christmas. Christmas things are starting to creep in to the shop. Yesterday I displayed Kate's lovely new decorations and Sue Inglis came in with knitted Christmas pudding cards. Some people (not me) are organised enough to spread their Christmas buying over the whole year. I do see the sense in buying something you love when you see it as chances are it will be gone when you go back for it. That's all about recognising quality. I like to think that Handmade Happiness is all about quality. There are beautiful things in the shop made by very talented local people. At the moment lots of people are coming in and telling me they will be back to buy their Christmas presents and they love the shop. Excellent. November and December is when shops like mine take most of their money. In fact the majority of shops take most of their money in November and December. To encourage people to spend the rest of the year they have sales. A handmade shop cannot have a sale it just has to hope that those people who spread their Christmas buying over the year visit! I'd like to know what sheep think about. And whether or not they dream. And how much communication takes place between one sheep and another. Perhaps if I watched those countryside programmes on the tv I'd know more or perhaps no-one knows the answer to those questions. Anyway these are the sheep I saw on Sunday with my mother. I went to Chichester yesterday and enjoyed looking at the clothes and jewellery in Sahara in South Street. They stock Out of Xile a brand Tricot Too used to have. What I actually bought were some sticky labels for work from the Martha Stewart range for Staples and 3 Pritt glue sticks from the same place. And some luggage labels for prices from Office Supplies in Crane Street. The purpose of the trip to Chichester was to pick up a box of handmade Christmas decorations from Kate Hackett. Her ceramic decorations are very popular. I know it feels a little early but I'm puting them on display in Handmade Happiness today. Did you know there is now an area in Handmade Happiness of fabrics to make with? As you come in the door it's on your left. Everything just £1 in the basket pictured. Other fabrics and lace etc. are individually priced. Did you see this Channel 4 programme about stylish women over retirement age? I loved it and I notice it's repeated tonight on 4seven (channel 47 on freeview) at 8pm. I took the photos from the tv which is why they are not good photos. These women - aged between 75 and 91 are gutsy and individual. They enjoy their lives and embrace fashion. Sorry I can't remember their names but from the top down, this lady presented her portfolio of pictures to modelling agencies and she looks great! The person I've not photographed is Daphne Selfe - a beautiful, highly successful model often featured in magazines who is in her mid-eighties. Next down is the art lover who wears black and has a selection of painted/appliqued/ extraordinary jackets to wear over the black. Love her style. The next picture shows a choreographer (she did 'Cats' among many others) still rehearsing dancers for West End shows now. Amazingly supple and fit! Finally this woman is the oldest person to have worked for Gap. She now works in a fashion boutique and looks amazing! To age well. That has to be the hope of all of us. To have confidence in ourselves and a bit of steel and fight. Not to sit quietly in an arm chair but to dance, sing, talk - be visible not invisible. As the French say 'd'etre bien dans son peau' - to be comfortable in our own skin and like these fiesty women to not let age stand in the way of being the person we want to be. New butterfly mugs and jug by Ali Cooper. Ali Cooper's work in Handmade Happiness now: Butterfly mugs and jug, pink dot mugs, jug and bowl and stoneware jugs and berry bowl decorated in 24 carat gold. Here are Ali Cooper's new pieces for sale in Handmade Happiness now. I'm looking forward to a busy day in the shop today. An American habadashery shop I'd love to visit! A page from my notebook in 2008! These pictures are all from late 2008 but they're still interesting and in trawling back through old pictures I'm hoping I can kick start myself into doing some serious making now. I want to make felt, make jewellery and make Christmas decorations oh and finish the knitted bag I started yesterday. On Tuesday drop in craft sessions start again at Handmade Happiness. Anyone can come and the theme, of course, is making for Christmas. Tuesday 7.30pm to 9.00pm. And I think I'll suggest that thereafter it's held on another day as many of us are following the Great British Bake-Off on the telly on Tuesdays. Yesterday Ali Cooper brought in more of her lovely pots and a pair of butterfly mugs sold immediately! Picture to come. I bought these little velvet flowers in France years ago. These tiles are underfoot in a shop entrance in Havant..
Red and pink Marimekko with velvet, yarn and a Guzzini pot. I've spent far too long this morning looking at old photos. I'm deciding what I can best focus on making. Jewellery is best because it doesn't take as long as making a bag or cushion or doll and it sells fairly fast. But what am I actually doing right now? I'm painting wooden letters and numbers to sell in the shop's 'to make with' section. I have a bag full of each and I figured they'll look better if they're painted in nice colours. This is not a good use of my time. If I had a boss they would say, 'Stop! Do what makes you money.' The trouble is you have to do what you feel like doing. If you're not in a jewellery mood you have to just do what you can do. Hopefully the jewellery mood will come to me later in the week!! Can you relate to this? 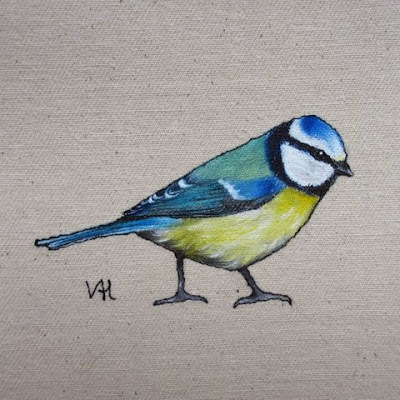 Vicki Hunt delivered three of her impressive bird paintings to Handmade Happiness yesterday. 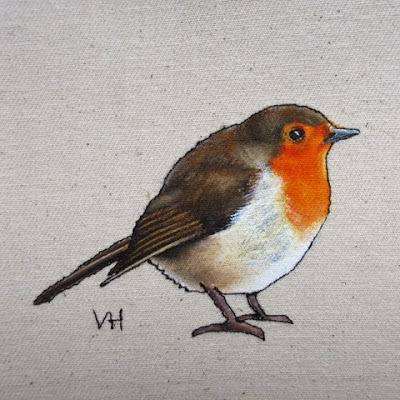 She paints on to thick fabric and then outlines the birds in stitch. All three are framed in square white frames and are £75- each. I am proud to have her work in my shop. I know some of you hate the 'C' word but I am thinking about 'C' a lot at the moment. Can I ask any makers with work in Handmade Happiness to contact me to discuss what new things they intend to make for Christmas. I'd like to have Christmas items in the shop at the end of this month. If you are visiting this week or I've spoken to you in the last week don't worry about contacting. Some silver glitter, some gold glitter. Making things for a wedding instead of buying them not only saves money but also gives the wedding a really individual look. At the Stacy-Foyle wedding men wore flowers made of pink crepe paper and white crepe paper flowers were strung in long garlands from the beams of the outbuildings. And gold and silver star garlands hung down the walls. The real flower petal confetti came from my garden and two of my friends' gardens! Everyone was passed a collaged card cone (made by Sophie) of confetti to throw over the newly married couple. The couple were really lucky in having a perfect venue for the reception at Jesse's family home. His family worked so hard to make everything perfect for the big day. The garden looked amazing and extra salad stuffs were grown in the kitchen garden to feed the 80 guests. There was no official photographer, guests took photos. The DJ at the disco turned out to be a surprisingly life like shop mannequin dressed up. Lots of donated strings of fairy lights hung everywhere and the big bulb light garlands were the village Christmas decorations loaned free of charge! It was a wedding where everyone pitched in with their skills or their possessions to make it the best day ever! And honestly...it was. It was a beautiful wedding. Taunton registry office feels like a church inside with an aisle and lots of seating for guests. Amy looked stunning in a white silk column of a dress and Jesse, all 6ft 4" of him looked very handsome. This is Pam Dew's third applique' cushion. Pam often travels by bike. In fact she regularly cycles from Petersfield to Chichester, where she works, and back. She takes photos of favourite views as she goes. 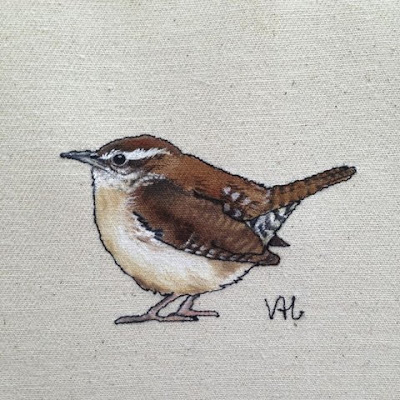 She then uses the photographic reference to sew her cushions. Handmade Happiness sold her big 'View at Compton' cushion and the shop currently has her 'View at Funtington' cushion. Well worth a look. Pam also teaches sewing skills at workshops in Petersfield. This week's selection in the Handmade Happiness window. small cards by Dave Tull £1-20 each; knitted teddy by Joyce Holland-Hill £6-50; crochet mice with lavender by Harriet Gardiner £5 each; jug by Kate Hackett £18-00; red heart by Eileen Brown £3-00. Baby hat by June Knight £9-50; rabbit with carrot (sorry he has a very nice head as well) by Sue Inglis £18-00; tea light holder by Samantha Robertson £10-00. Decorated porcelain bowl by Ali Cooper £16-00; four slate coasters by Eve Deary £16-00 and crocheted lobster £6-00 by Harriet Gardiner. New applique cushions by Pam Dew are in the shop now plus new lino cut card designs from Jacqui Watkins and yesterday also saw a delivery of the popular smaller size teleidoscopes from Frank Higgins. Please note I will not be in the shop tomorrow (Friday) or Saturday as I'll be at my daughter's wedding but the shop will still be open for business as usual. One of the pleasures of visiting a new town or city is finding something special to make with. Top of my places to find nice things to make with would be Paris but I haven't been there for many years I just have fond memories of stumbling upon little shops tightly packed with ribbons, fabrics and yarn, all lovely quality. And the shops selling all things paper - paper looking like wood, frosted transparent paper in lime and hot pink, rag papers dyed all the colours with bits of leaf in it. In one street there are three shops selling just papers side by side. These pictures were taken in Guildford's Pandora and even closer to home I have found nice stationery in Academy Art shop off Station Road, here in Petersfield. When I lived in Chichester I would sometimes visit the Fontwell car boot sale and found some lovely bits for making with there. I think there was someone there who used to make theatre costumes and was gradually selling off her own making supplies. Finding something special that inspires you whether it's at home or when out and about makes it easy to translate it into an item that pleases you. If you are going to put hours, days, weeks or even months of effort into making something it's important to use the most pleasing-to-you materials you can. A little bit of perfect is worth any amount of 'it will do'...! I like the new broken stripe design of Kate's latest blanket. It would make a wonderful present for a new baby or I can imagine it draped over a sofa bringing a piece of modern art into a room. On my day off yesterday I painted a new shelf unit for the shop. It will hang in the first room and house the stacks of fabric pieces I am selling in the 'to make with' area. Some people love 'bark cloth' others are searching for 1940s fabrics. I hope to have something to appeal to anyone looking for fabrics to make with. The worst bit, for me, is the pile of ironing!! Yesterday I got an email from a UK firm selling bulk quantities of glitter. This is very good news after my unsuccessful search for nice glitter for the wedding. I do like a bit of glitter at Christmas so I'm off to order some for the 'to make with' area of Handmade Happiness.